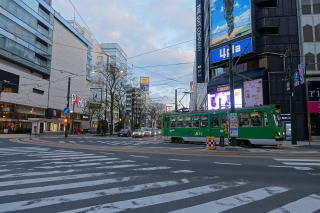 Railway Company (JR Hokkaido), and is also connected to the Subway Sapporo Station. 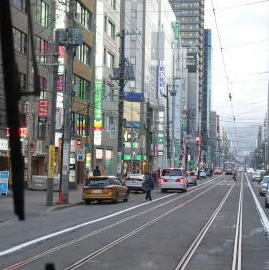 Sapporo Station is the starting point and terminus for most limited express services operated by JR Hokkaido. 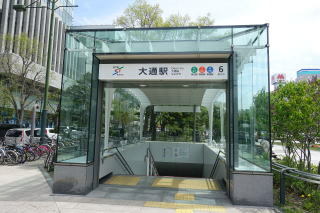 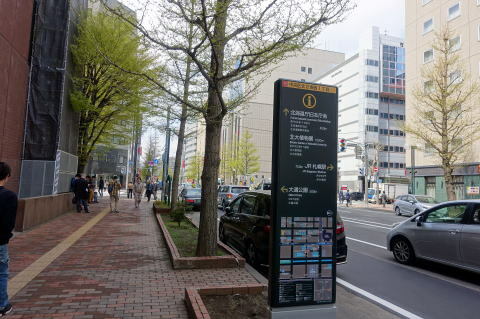 (L) The entrance to Odori subway station: It is covered with transparent walls considering the surrounding landscape. 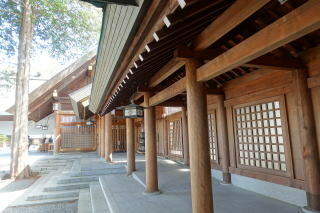 (L) Mamiya Rinzo, 間宮 林蔵, was a Japanese explorer of the late Edo period. 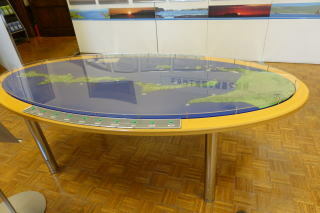 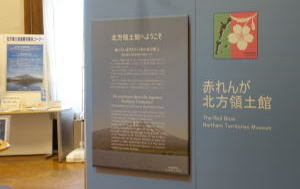 He is best known for his exploration and mapping of Sakhalin. 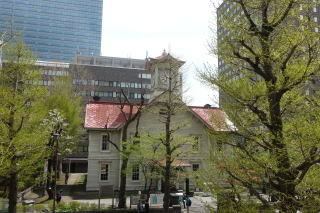 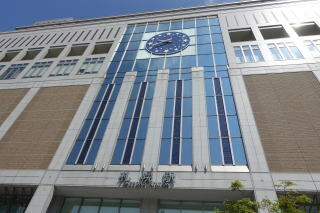 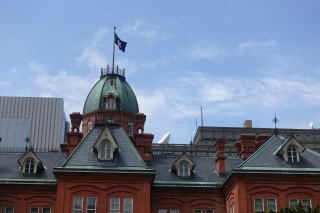 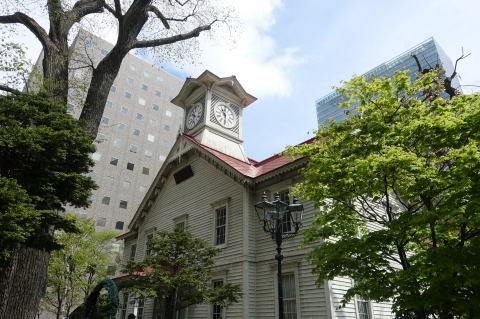 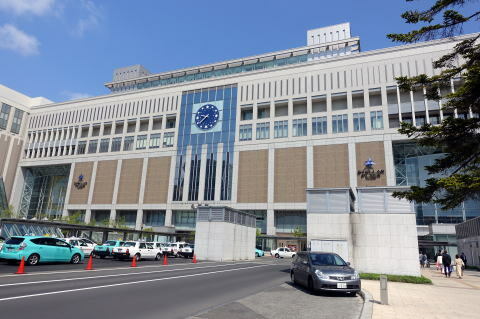 The facility of the former Hokkaido Government Office is located in Sapporo. 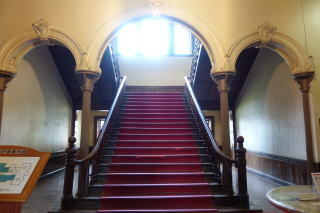 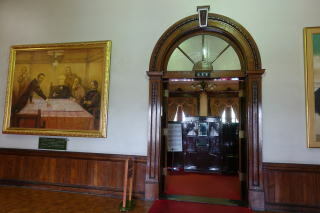 Visitors can enter the building for free. 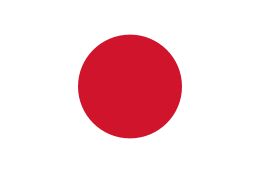 Island, which is used to be the Japanese territory, and has been occupied by Russia since the end of World War II. 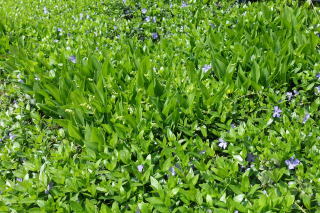 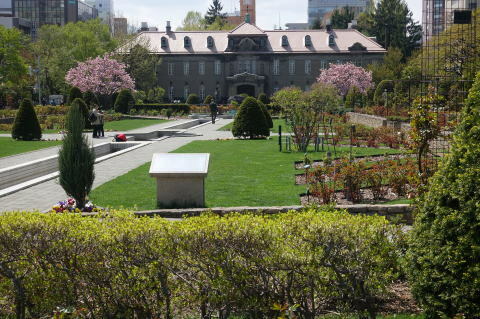 Flower gardens　and a pond are located in front of the building. 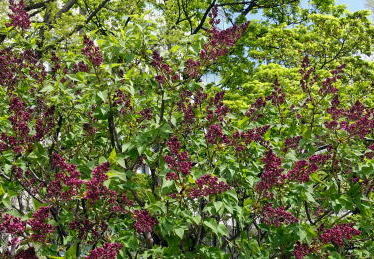 (L) The thermometer shows 13℃ in the air of this place on Odori Park (R) Lilac flower: A Lilac Festival is usually held in Mid-May at Odori Park of Sapporo. 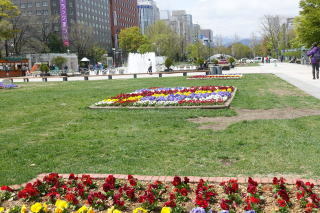 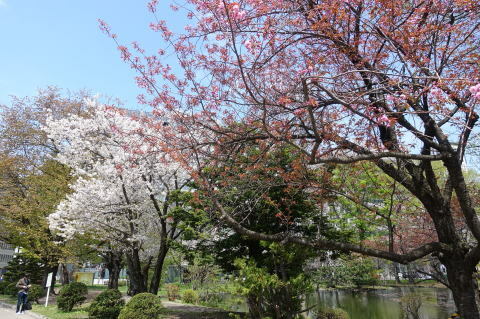 In May, Odori park is full with a rich natural sprout, colored by flowers. 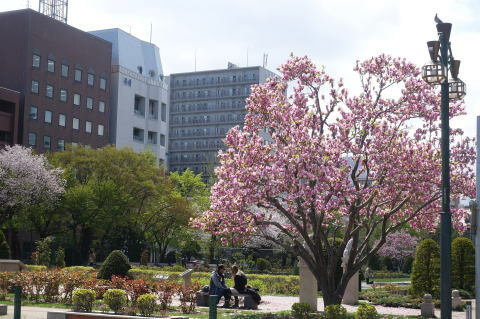 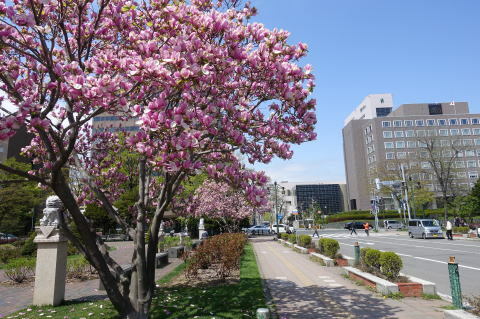 (L) Former Sapporo Court of Appeals (R) Red-purple magnolia in Odori Park is in full bloom. 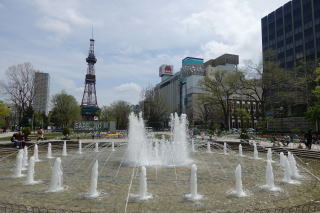 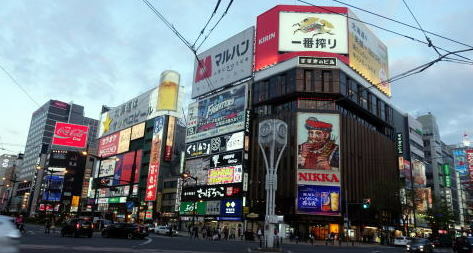 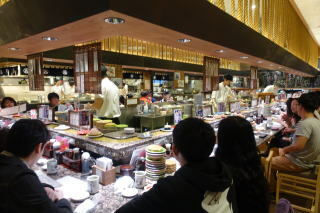 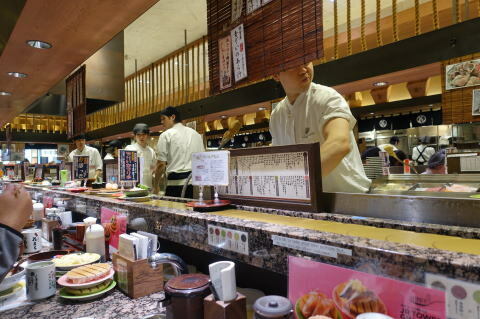 Sapporo is the fifth biggest city Japan by population, and the largest city on Hokkaido. 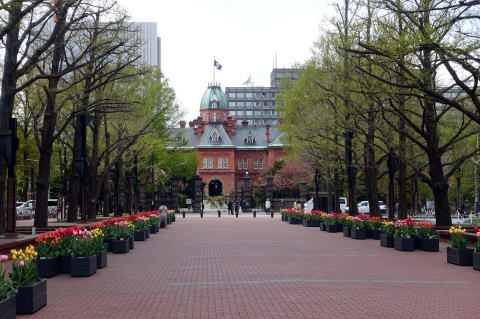 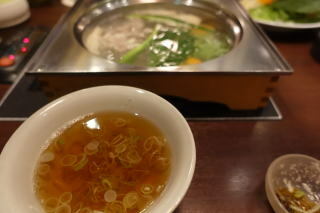 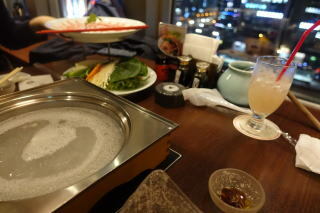 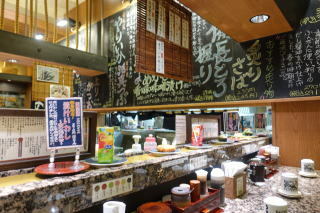 It is the capital of Hokkaido Prefecture. 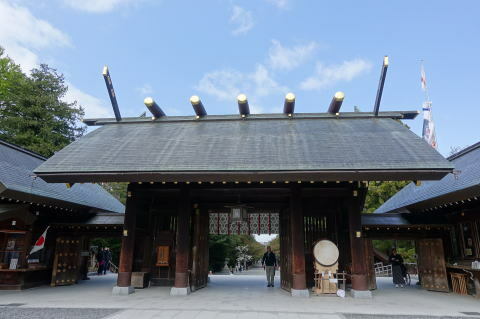 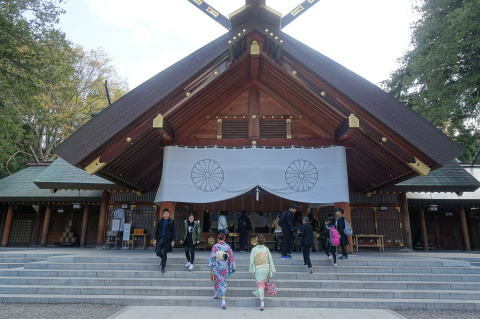 The approximate city population is 2,000,000, as of May 2018.
the Hokkaido Shrine enshrines four 'kami' including the soul of the Emperor Meiji. 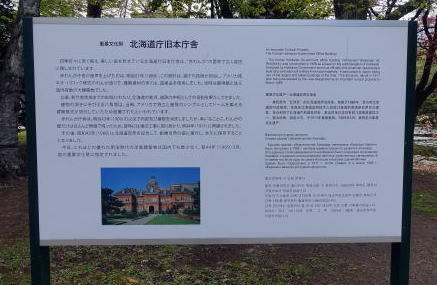 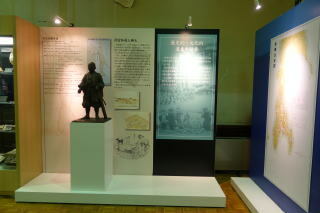 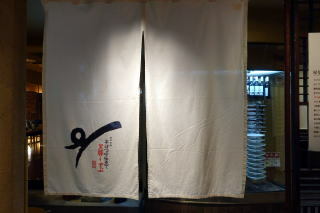 A number of contributors of the Exploration in Hokkaido such as Mamiya Rinzo are also enshrined. 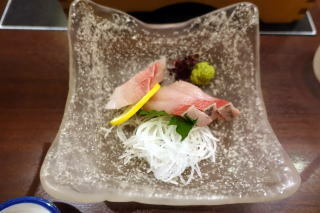 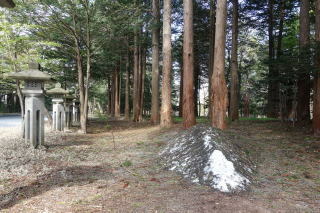 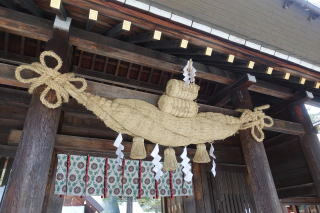 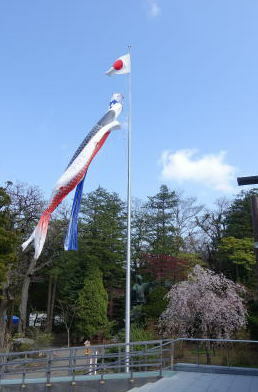 (L) A carp streamer (M) Chozuya (R) A snow was still remained on the Shrine ground. 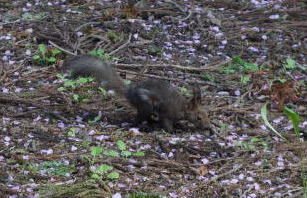 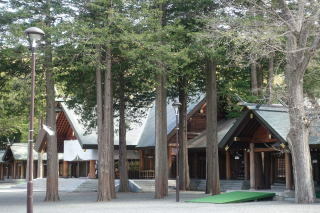 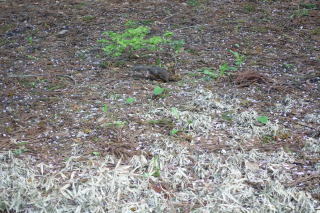 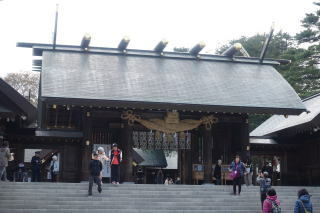 (L) A squirrel is searching foods on the ground of the Shrine. 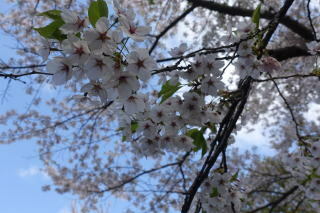 (R) Cherry flowers are scattered by the wind. 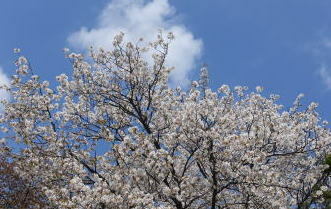 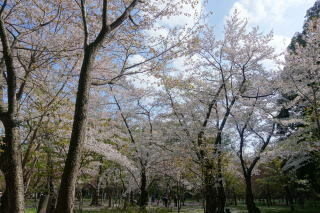 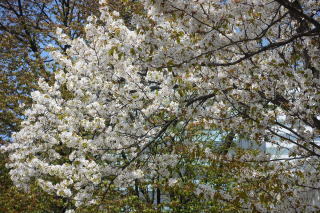 (L) It is filled the ground with scattered cherry blossoms. 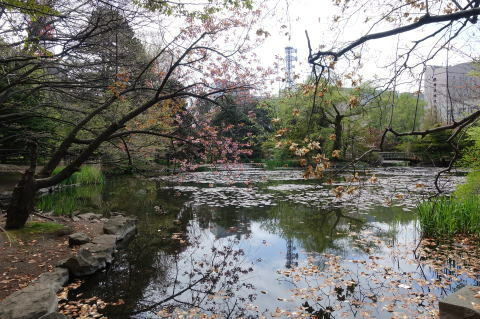 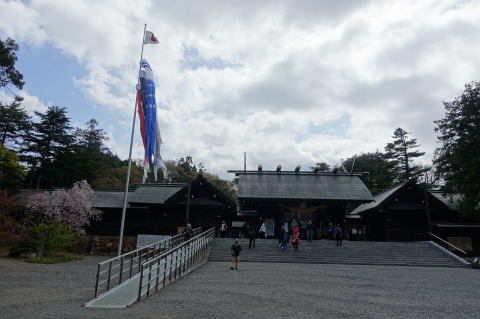 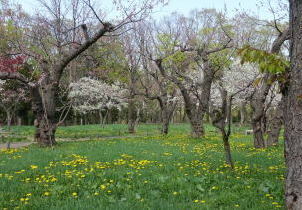 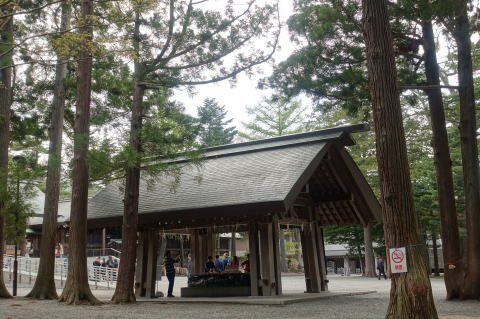 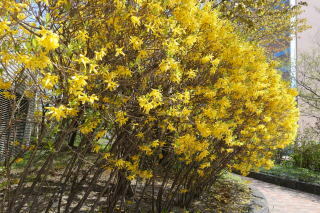 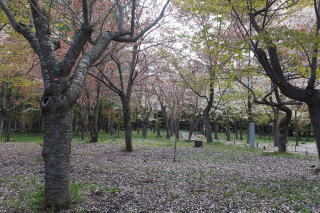 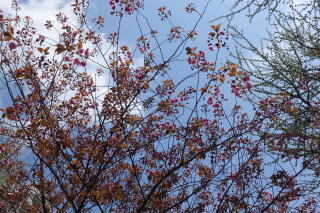 (R) The Shrine ground is filled with light-pinkish cherry flowers and yellow dandelion. 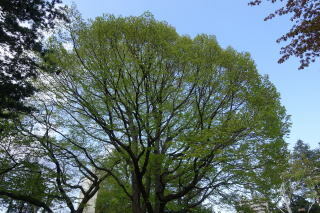 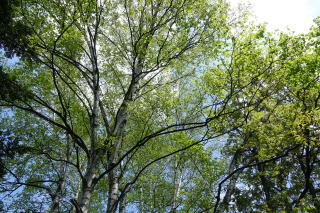 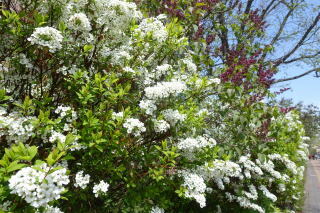 (L) A wild cherry tree (R) A fresh-green big tree, which extends to sky. 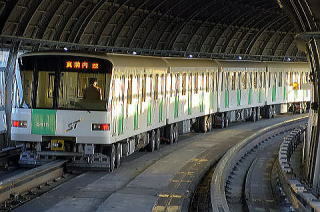 The Sapporo Municipal Subway is a mostly-underground rubber-tires metro system in Sapporo. 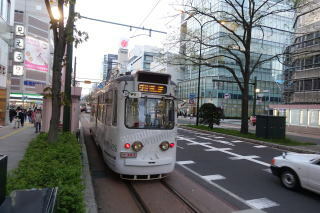 Operated by the Sapporo City Transportation Bureau, it is the only subway system throughout the island of Hokkaido. 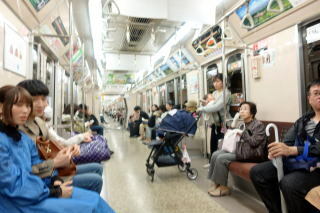 All lines through the subway use rubber-tires trains that travel on two flat roll ways, guided by a single central rail. 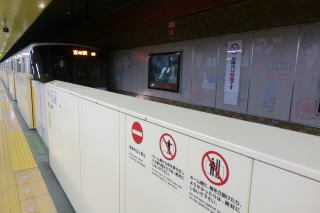 This system is unique among subways in Japan and the rest of the world. 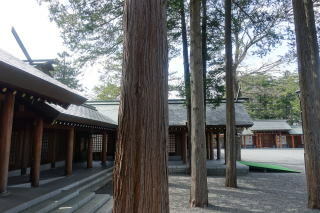 as simply the 'shiden'. 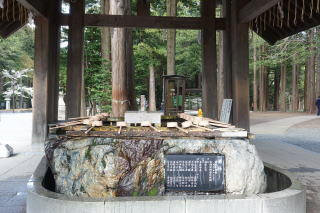 It was electrified in 1918. 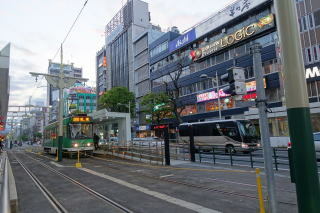 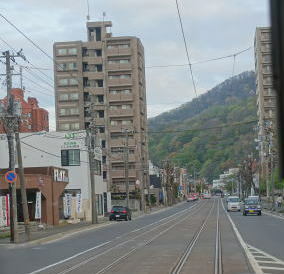 The Transportation Bureau took over the network in 1927.
into a single circle route following the opening of the link between Susukino and Nishi-Yon-Chome in December 2015. 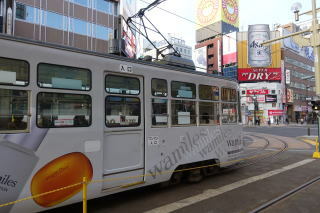 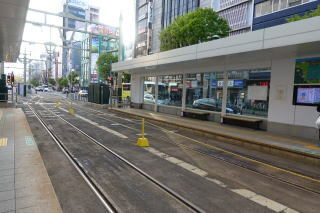 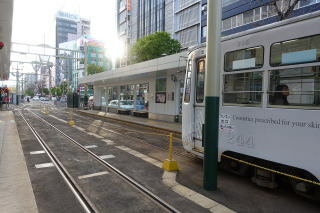 (R) A tramcar is running in the direction of north. 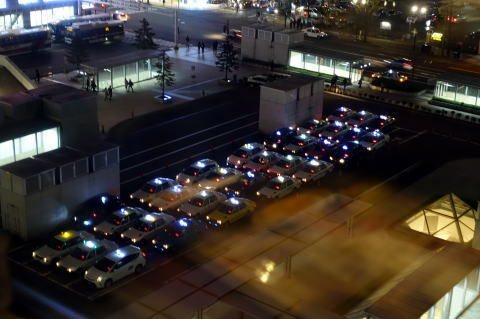 (R) Taxi lines up in front of Sapporo station without clearance. 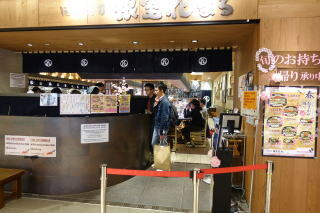 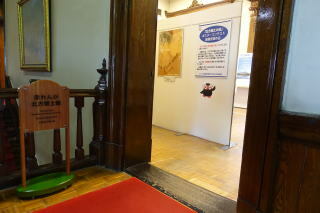 There are few customers, and the taxi industry in Hakodate appears to be pressed for an extremely painful management. 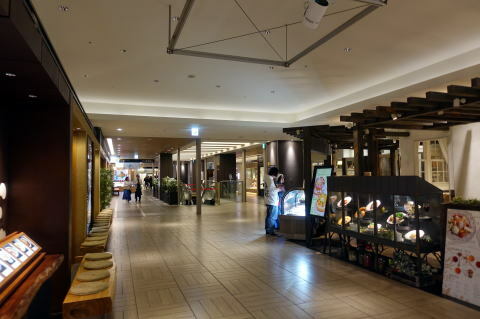 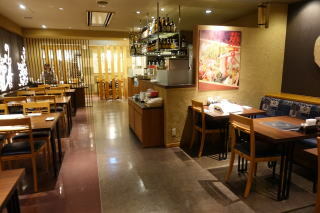 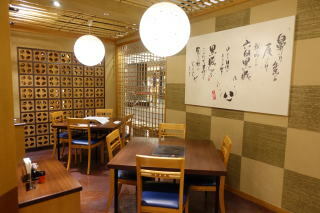 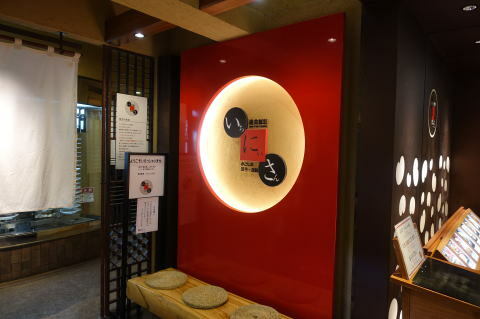 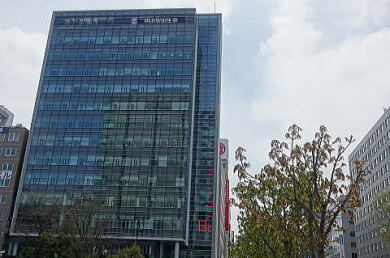 All food stores of Station Building, Stellar Place Center, is smoke-free, except for a designated smoking room on the sixth floor. 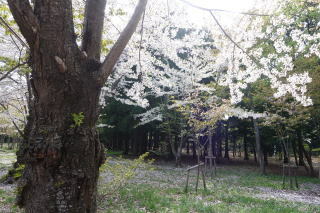 The article was writtenand photography was taken in May 2018, by Junhaku Miyamoto, M.D., PhD.